This particular Examiner missed the point. 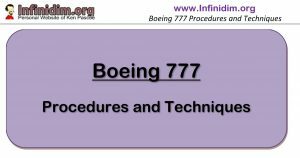 While the Boeing transition course, and the associated documentation explains the system in detail – the value of this system is in not needing to know the nitty gritty. The reason this system is in place is to keep the detail away from the pilot’s attention during critical phases of flight – such as high speed takeoff – and only present just what you really must know in order to make simple what would otherwise be a complex decision at high speed during a time critical phase of high stress. Unfortunately that wasn’t communicated to me at that time, nor was it communicated 6 months later when I did another check with the same Examiner, nor even the time after that. I finally realised that this display wasn’t being done to teach me anything in particular (or at least not anything useful); it wasn’t even being done to demonstrate my lack of knowledge or lack of commitment to excellence (even though it seemed that way at the time); it was done to show me the extensive repertoire of nonsense that this gentlemen had command of, along with a very firm grasp of the non-essentials. I showed this on the screen, and told the candidates they had a couple of minutes it memorise it before I start asking questions. Not. 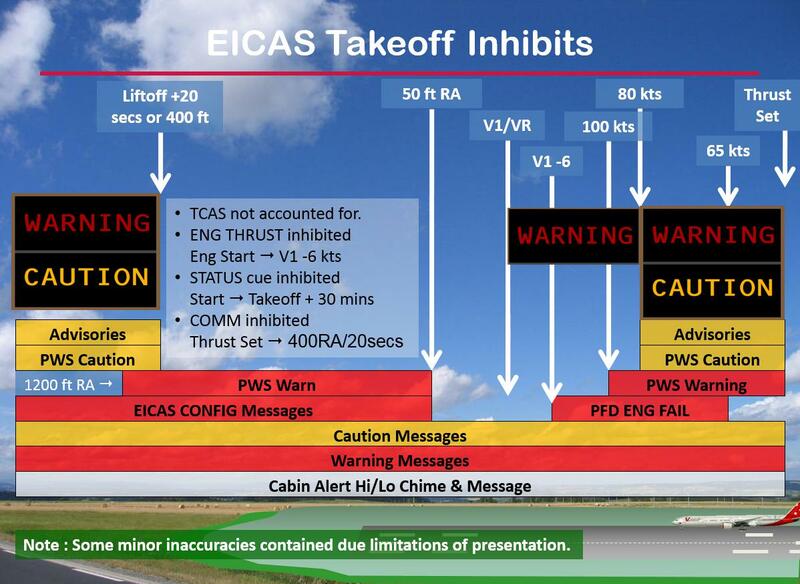 The Master Warning/Caution Lights and Aurals are inhibited from before V1 (Decision speed) until 400 ft / 20 seconds after liftoff. So what do we stop for? 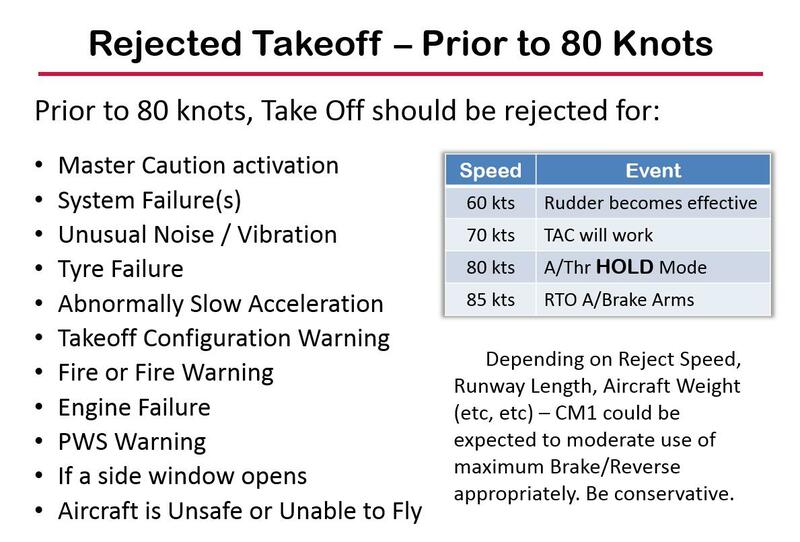 Low speed rejected takeoff’s are usually less critical and as such you’ll initiate a reject for less serious reasons. That doesn’t mean they’re not a handful. In practice however, I sat beside a Captain once who was given a complete engine failure at about 50 knots in just such a scenario. At these speeds the autobrake does not arm, and the auto throttle is still actively engaged. He rejected the takeoff, closing the thrust levers, before reaching for the speedbrake. But he forgot to disconnect the autothrottle and so the levers advanced up again as he reached for the speedbrake lever. Being the big beast that it is, the still functioning non-failed GE90 777 engine had barely begun to spin down from it’s 115,000 pounds of thrust before the lever was back up again and thrust began to restore the barely previously left full power setting. Since at these speeds you’re well below VMCG (minimum speed for being able to steer the aircraft straight with large amounts of asymmetric thrust) – we were in the grass off to the side of runway before He (or I for that matter) could work out what was going on. A quick analysis, a reposition to the start of the runway, and we did it again. 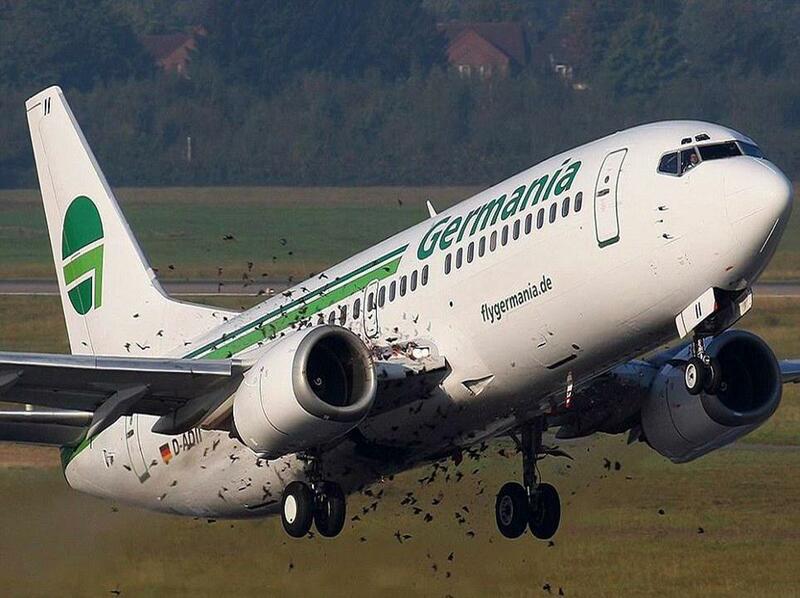 And I mean we did it again – off the side of the runway once more. After the third try, and the third attempt to mow grass with a 270 million dollar airliner – cooler heads prevailed and we took a break. High Speed Rejected Takeoff is an exercise in and of itself – practiced and perfected in no small degree during transition and upgrade training. Despite the veneer of calm professionalism pilots display at all times (which my wife calls my “air of authority” Ha! ); the last thing we actually like doing is making really important decisions with serious outcomes during highly critical phases of flight – in a hurry. That’s why the inhibit system is so great – it reduces genuine complexity down to some fairly simple options. Keen eyes will note that the CABIN ALERT chime (referred to as the PILOT ALERT by cabin crew) is not inhibited at all during takeoff – and neither is the associated Hi/Lo Chime. A useful exercise, to be followed by a consequence-free and open discussion afterwards, is the following I like to give to newish 777 Captains in “extra time” in the sim. 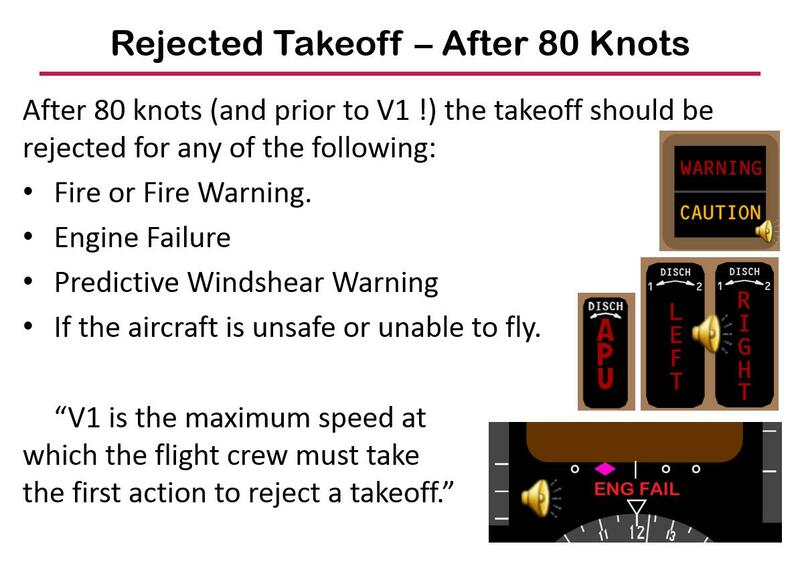 The PFD failure is nasty because the Captain/PF loses his/her primary reference for speeds, pitch, altitude, tracking – all that good stuff. If you haven’t had it before, it’s not a small thing. But two deep breathes and the 777 automatically switches the PFD across to the secondary screen and all is good again. Besides – you’ve been taught that unless the aeroplane talks to you during takeoff (Buzzer/Chime/Siren etc) – you shouldn’t stop. When you are operating smaller aircraft on longer runways – it can be hard to argue with success, right up until the point where someone rejects at high speed for a birdstrike that doesn’t impact the aircraft’s ability to fly, and that aircraft runs off the side or the end of the runway. Fundamentally if the aircraft is safe to fly and you’ve reached the high speed regime, the manufacturer (and almost without exception your Standards Department) wants you to take the aircraft – and the problem – into the air. Taking the aircraft into the air from the high speed regime is something we do everyday – sometimes several times a day – as part of our business-as-usual operational practice. Stopping the aircraft from high speed within the confines of possibly not longitudinally but always laterally limited piece of pavement is something we practice perhaps twice a year, in the simulator only. It’s a high risk maneuver. As such I agree with the Manufacturer (easy course to take, I know) – unless the aircraft isn’t safe to fly – take the problem into the air. In some ways this argument parallels a similar discussion regarding Unstable Approach (see Checking in the Aircraft). If you get down to 1000 ft and you’re not stable, but you soon will be, why can’t you continue past 1000 ft and go-around later if you have to. The answer is that policy compliance here is required at least in part for the big pictures of safe aircraft operations. 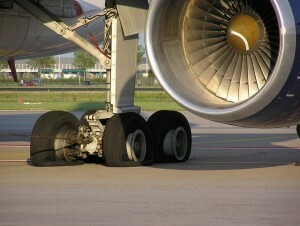 It may be justifiable that for your situation on the day continuation might not be unsafe at all; it is undeniable that the policy of requiring all aircraft to plan and fly to meet stabilisation criteria, and go-around if they are not stable, has reduced the industry accident rate considerable. 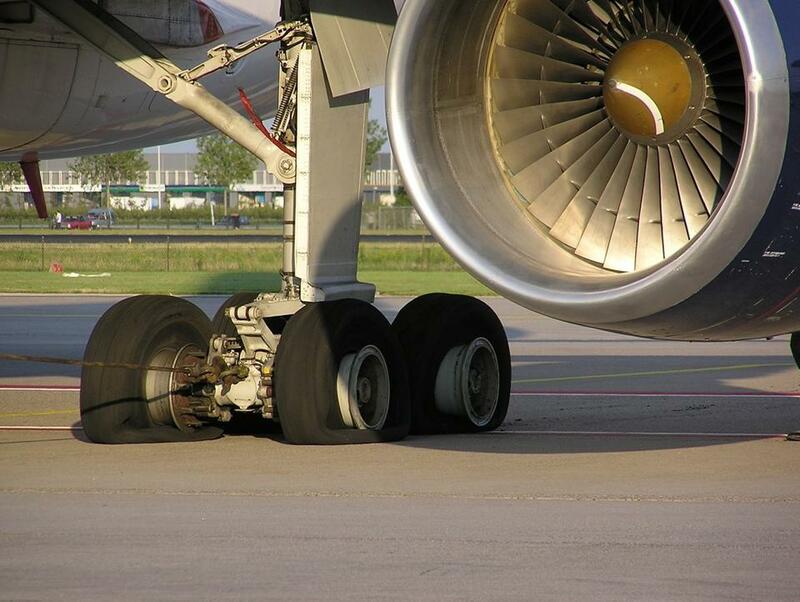 Recently I saw a failure in the sim at high speed of the loss of 4 of the 6 tyres on the LH bogie in a 777. I am certainly not new to any of the seats in the sim, and despite the fact that I am fully cognizant that when it comes to noise and vibration the simulator just can’t reflect the true severity we will see in the aircraft when the real thing occurs – I was surprised at the level of noise and vibration this failure gave us in the sim. As the examiner – I fully expected the Captain to stop the aircraft as a result, which he did not. Speed still increasing, thrust still there – “Go!“. While it was was what I wanted to see, what I expected (theoretically) to see, it was definitely nice to watch.